Be joyful as you hope [i.e., for future blessings]. Persevere in spite of the troubles you experience. Continue steadfastly in prayer. 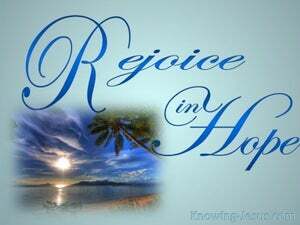 Rejoice in your hope, be patient in tribulation, be faithful in prayer. 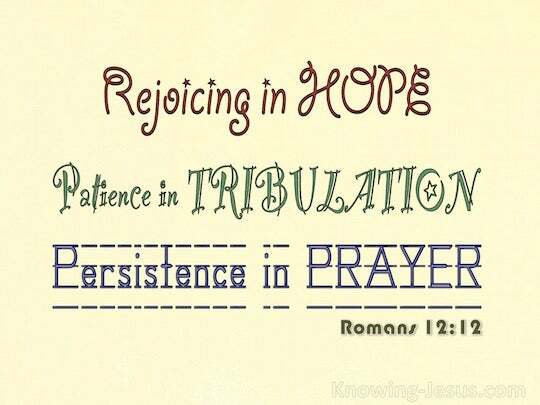 Be happy in your hope, steadfast in time of trouble, persistent in prayer. 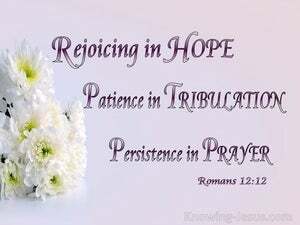 Rejoice in hope, be patient in tribulation, continue instant in prayer. 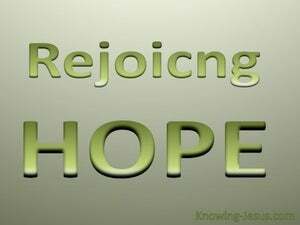 Rejoice in hope. 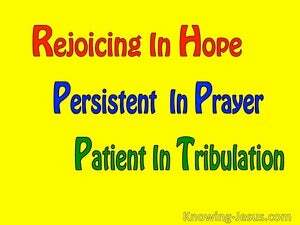 Be patient in tribulation, continue in prayer. 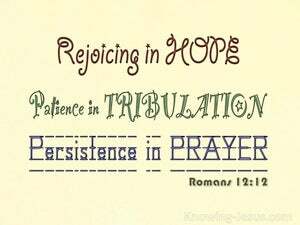 Rejoice in hope; be patient under affliction; continue stedfast in prayer. 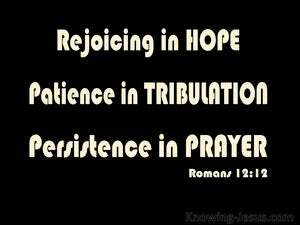 Rejoice in hope; be patient in affliction; persevere in prayer. 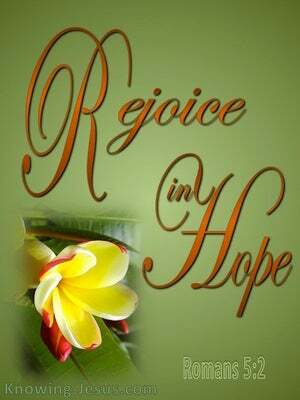 full of joyful hope, patient under persecution, earnest and persistent in prayer. 11 not lagging behind in diligence, fervent in spirit, serving the Lord; 12 rejoicing in hope, persevering in tribulation, devoted to prayer, 13 contributing to the needs of the saints, practicing hospitality. Trust in Him at all times, O people; Pour out your heart before Him; God is a refuge for us. Selah. Therefore my heart is glad and my glory rejoices; My flesh also will dwell securely. As for me, I shall call upon God, And the LORD will save me. With Your counsel You will guide me, And afterward receive me to glory. 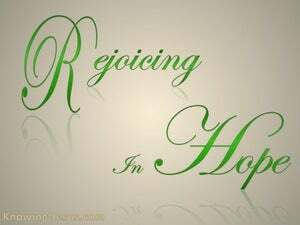 The hope of the righteous is gladness, But the expectation of the wicked perishes. Concerning this I implored the Lord three times that it might leave me. In the days of His flesh, He offered up both prayers and supplications with loud crying and tears to the One able to save Him from death, and He was heard because of His piety. and the prayer offered in faith will restore the one who is sick, and the Lord will raise him up, and if he has committed sins, they will be forgiven him.